Replacing your windows every time you think about adding value to your house isn’t going to be cost effective or necessary. However, investing in quality windows once and keeping on top of your maintenance is. Not only is this going to improve the aesthetics of your home internally and externally. It will increase the heat retainment of your home and reduce unwanted noise from outside. New windows also have better security features, giving you added peace of mind. 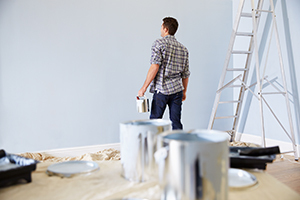 Every time you pick up your roller and go over your walls with a fresh coat of paint, you are going to completely refresh the look of your room – that’s a given. Of course, that’s providing that it’s a neat and tidy job!. However, it’s not just the walls that benefit from a lick of paint. Overtime, the colour and shininess of internal doors will fade and discolour. This can be apparent once you’ve painted your walls. Painting your skirting boards and doorframes along with the doors is additional work, but really pays off giving your room a truly finished and fresh look. Whilst having a huge garden renovation with lots of digging, paving and plants is going to significantly improve the value of your home, it could be a substantial investment too. But there are smaller things you can do that won’t break the bank. Keeping on top of garden maintenance, even if only during the warmer months, is going to keep up the value of your property. Adding a support for temporary measure or fitting a new post or panel, can really make a difference to the feel and look of your garden, making it look cared for. Painting the wood in the garden when it fades and flakes. Lots of us have beautiful wooden garden furniture which looks great when we buy it, but actually requires annual maintenance. Prolong the life of your table and chairs by varnishing them each year in the spring so they don’t deteriorate and rot during the winter months. Paint your shed when you see the existing paint is beginning to flake. Keeping on top of this maintenance doesn’t take as much time as you think but can really extend the life of your wooden shed and make it more pleasing, aesthetically when you are relaxing in your garden. Weeding can seem a chore, but like dusting your house, it can make all the difference. Keeping on top of the weeds and regularly weeding during the summer months can help your garden not to get overgrown and be a more appealing and calming space for you sit in. If you really can’t face it, hiring a gardener for a few hours a month, is unlikely to hurt your wallet too much. Often overlooked, flooring can completely transform a room and more often than not now, trends are swaying towards hard flooring over carpet for living areas, with carpets still the favourite for bedrooms. If your home is open plan or semi-open plan, consider getting some fresh new flooring that is consistent throughout the house. Not only have wooden floors been the trend in a modern home for a while now, but the maintenance is easy, allowing you to keep it looking as good as new for a long time. If you like the look and feel of carpet, don’t dismiss the idea of getting big rugs. These can be changed over time to give a fresh look, can be removed on occasions when needed and can even help your hardwood floor last longer. Sometimes it’s the small things that make a big difference. Changing the door handles of your internal doors throughout your house so they are all consistent, new and modern, can truly change the aesthetic of your rooms. Adding a door knocker or a letterbox to your front door can also be a way to tweak the appearance of your house, making it look smarter and more appealing. Or what about adding a house number to your front gate or house wall? There are some modern and funky ways to add character and personality to your house, that help keep it modern and maintain its value and appeal should you consider selling it. We believe that all the above points will help maintain or improve the value of your home, but by far one of the key ways to do this is to replace your windows and doors. If you are thinking about modernising your windows and would like a no-obligation quote and advice, please speak to our team on 0117 911 0272 or visit our showroom in Bristol.